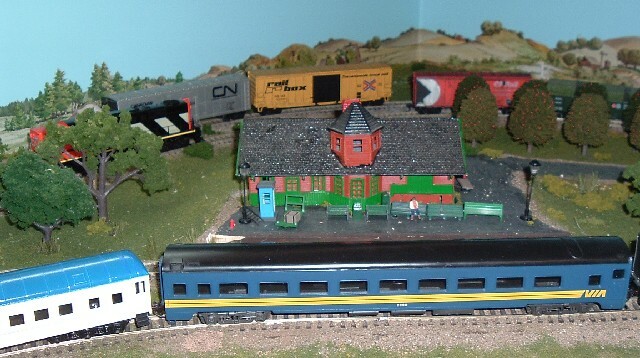 As promised, here are some photos of my old Nova Scotia Eastern Railway layout. A passenger train goes by the station on the main line, while a CN switcher shunts the Windsor & Hantsport siding in the background. 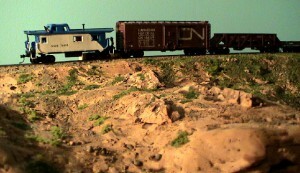 The NSER 76493 caboose brings up the rear of a short freight as they pass some rather desolate terrain on the approach to Windsor Junction. 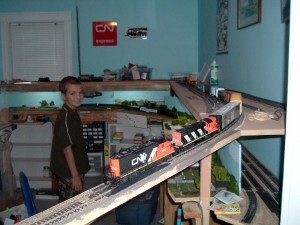 Two CN diesels begin the long haul down the escalator track from the Dartmouth Subdivision toward the junction with the CN main line. The Dartmouth yard is on the top level at the very back, behind my son. A view of the temporary Dartmouth yard. None of this track was intended to be permanent. 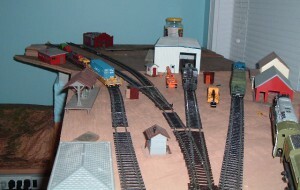 The layout was torn out before any permanent trackage was laid in this yard.